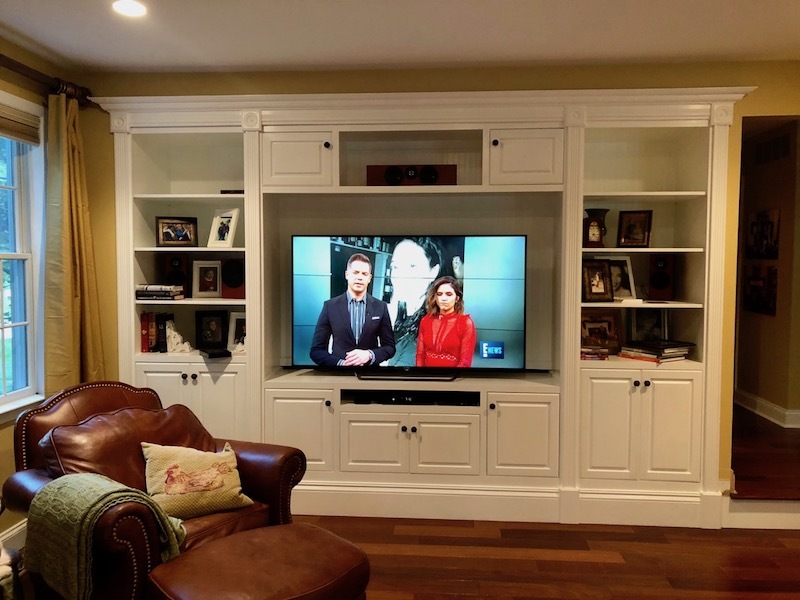 This article describes the creation of a built-in entertainment system using built-to-order Arthur Brown Face Frame bookcases and cabinets with custom trim used to trim it out and give it a built-in look. 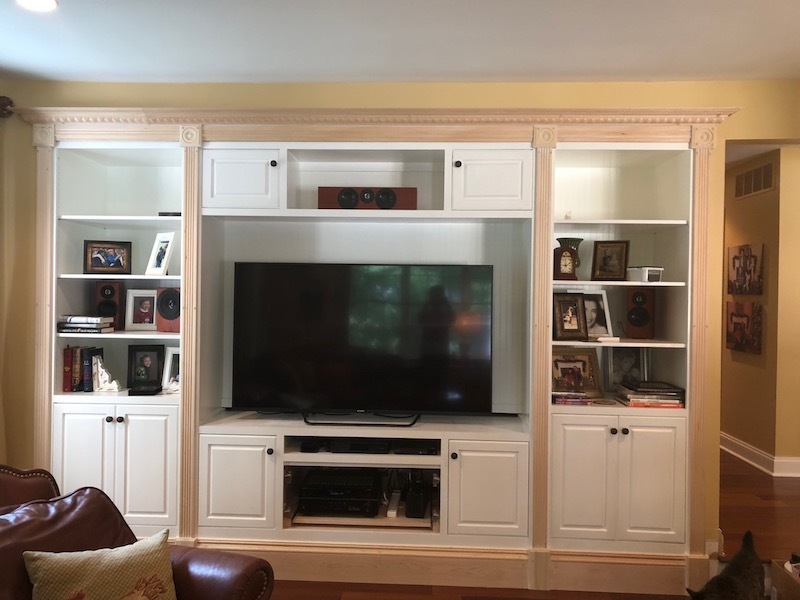 The bookcases and cabinets were made in a simple face frame style so that moulding could be chosen and added to fill in the gaps between the cabinets and the wall. This particular home has a step-down family room with a raised opening in the wall, which isn’t exactly your typical situation. This made it all the more tricky, since the base of the opening is 12 inches off the floor and the top has a bulkhead that is 12 inches from the ceiling, leaving 7 feet of vertical space to work with. It is about 11.5 feet wide. The project began by coming up with a design plan and then choosing bookcases and cabinets that would fit comfortably into the space without leaving too much space to fill on the sides and top. 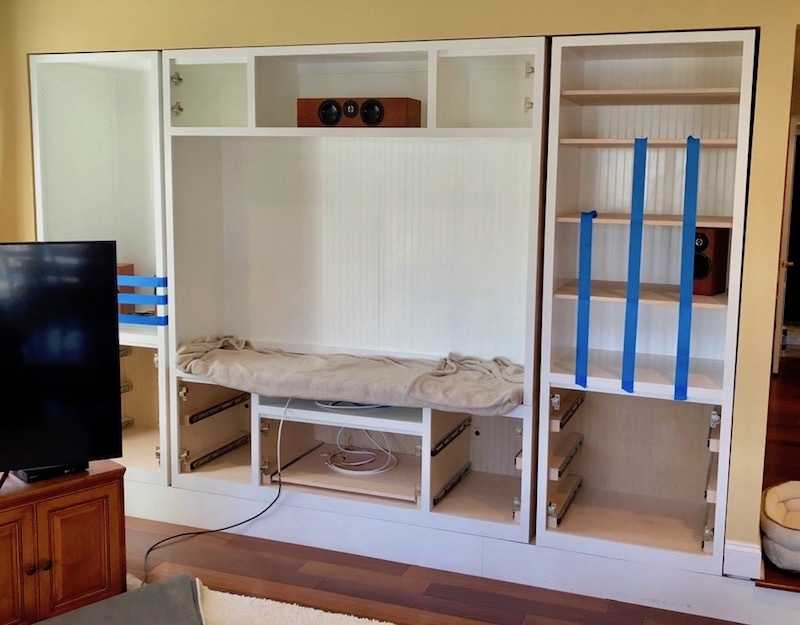 Since this was to be used as an entertainment system, there needed to be space for a large TV, speakers to the sides and above, media components below, and plenty of storage space for DVDs, books, and other items. 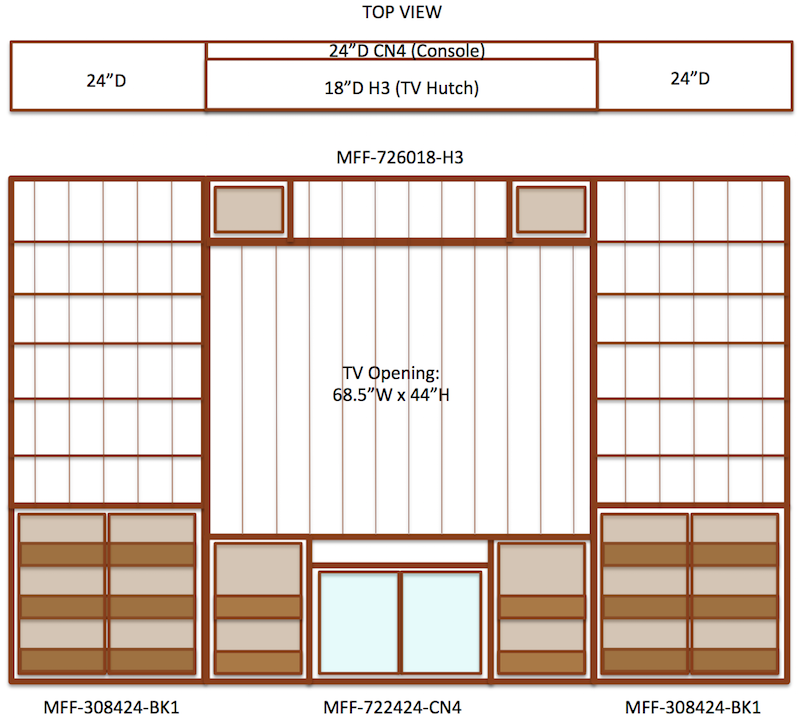 The center bottom piece is a “CN4” entertainment console with a TV hutch above. The side pieces are bookcases with lower doors. Each piece has pull-out trays behind the doors. The center console section has a pull-out shelf so that a heavy receiver can be rolled in and out to make it easier to connect the wiring. First, the wood flooring was removed from this area since it was no longer needed. Plus, the extra 3/4″ of space gained by removing the flooring made sure the 84″ tall bookcases fit in easily. 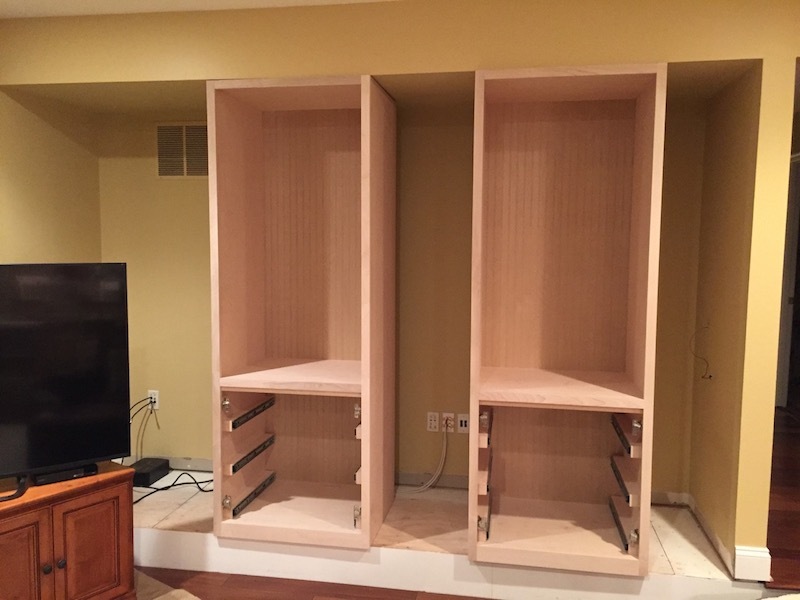 The photo below shows two 30″W x 84″H x 24″D unfinished bookcases, which just barely fit into the space after having removed the flooring. The bottom section has pull-out trays and doors, but these were taken off so that they could be more efficiently painted. The other pieces were moved to another area for painting. All the pieces were painted and then positioned in the wall space, leaving some gaps between them, which will later be covered with mouldings. 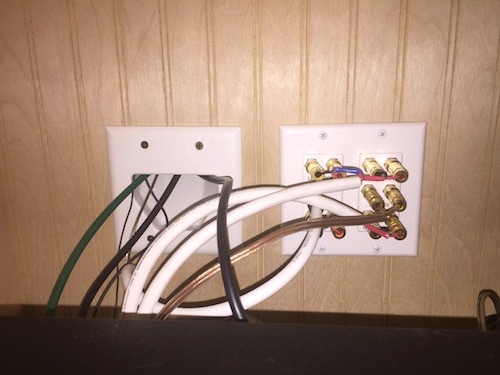 Before the pieces were permanently installed, it was necessary to run wires from where the media components go to where the speakers and TV will go. Holes were cut into the back panels and connector panels installed to enable wires to pass through from one piece to the next. Cables were connected to the backs of the panels so that some of the audio/video cables could be quickly and easily plugged directly into the front of each panel. Power was run to the bottom cabinet. The outer two bookcases were screwed to the side walls to ensure they do not move, while the center pieces were then screwed to the side pieces. On the floor, you can see the moulding that will be used to frame out the pieces and cover the gaps. Equipment was installed in the entertainment console. 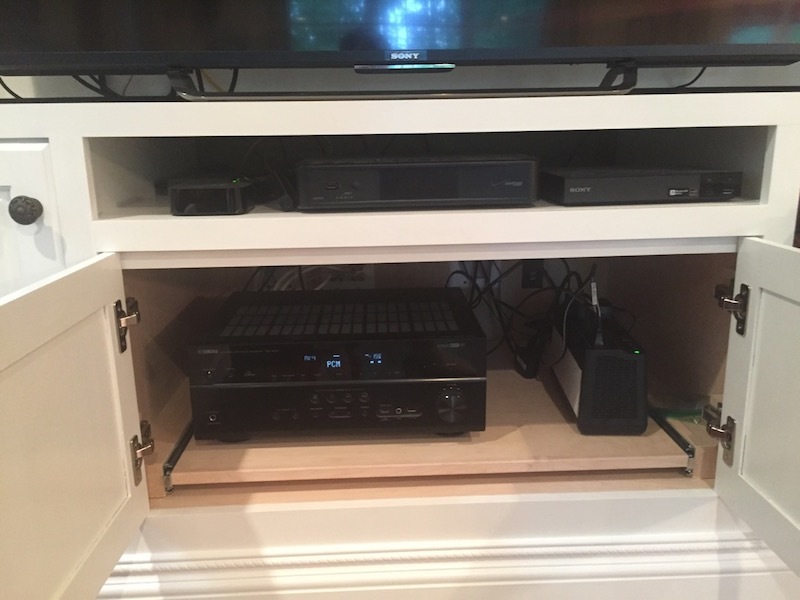 At the bottom center opening is a battery backup/surge protector and receiver.A pull-out shelf was installed to make it easier to slide the receiver in and out while connecting cables. In the short open shelf above are the media boxes, such as a cable TV box, Apple TV, and Blu-Ray player. Unfinished moulding was then nailed to the wall and face frame of the bookcases and cabinets. In between each piece is a custom-built column consisting of several stacked pieces: a plinth block at the bottom, a piece of fluted column above, and a rosette at the top. In between the plinth blocks are flat pieces of Maple wood with upside down chair rail moulding added to its top. 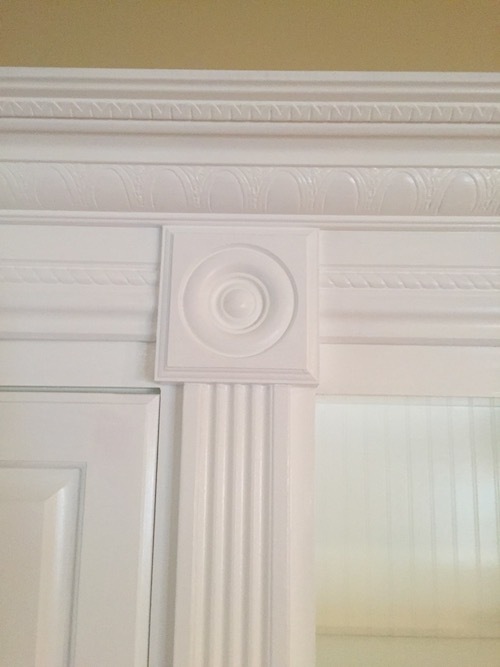 Above the cabinets is an inverted piece of base moulding was placed in between the columns. Finally, a piece of crown moulding was added at the very top. 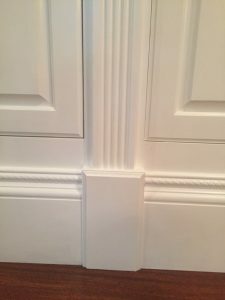 The moulding had holes filled, caulk applied to any gaps, and was then painted so everything flowed seemlessly together. You can’t even tell which pieces are separate from each other. 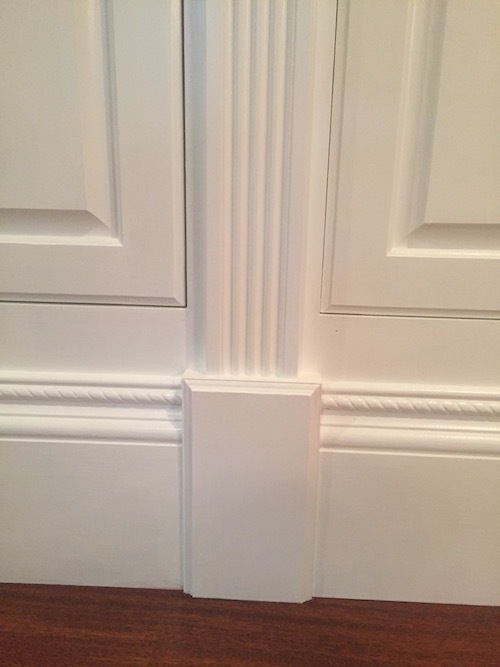 The first photo below shows the plinth block with fluted moulding stacked on top. To the side are flat pieces of wood with chair rail placed upside down on top. 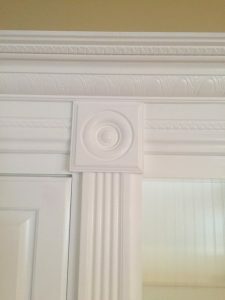 The second photo shows the rosette block at the top of the fluted moulding, with upside down base moulding on each side and crown above. Finally, everything is installed and plugged in. No more hole in the wall–it now looks completely built in! Inside the taller doors are pull-out trays for DVDs and other items. 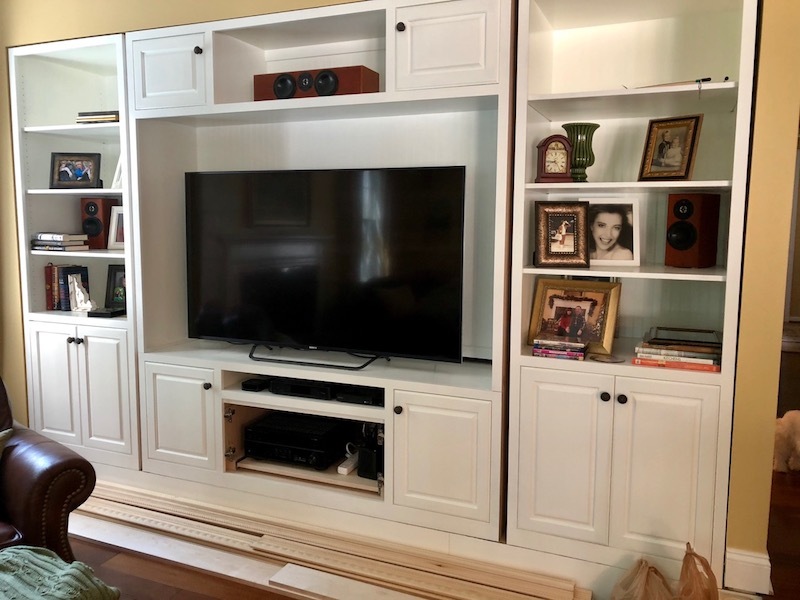 The following Maple, Face Frame Crown style, white-painted entertainment system was put together using a combination of bookcases, a center entertainment console, and a bookcase bridge. Here is how this was put together to create a cascading wall unit with varying depths and heights. 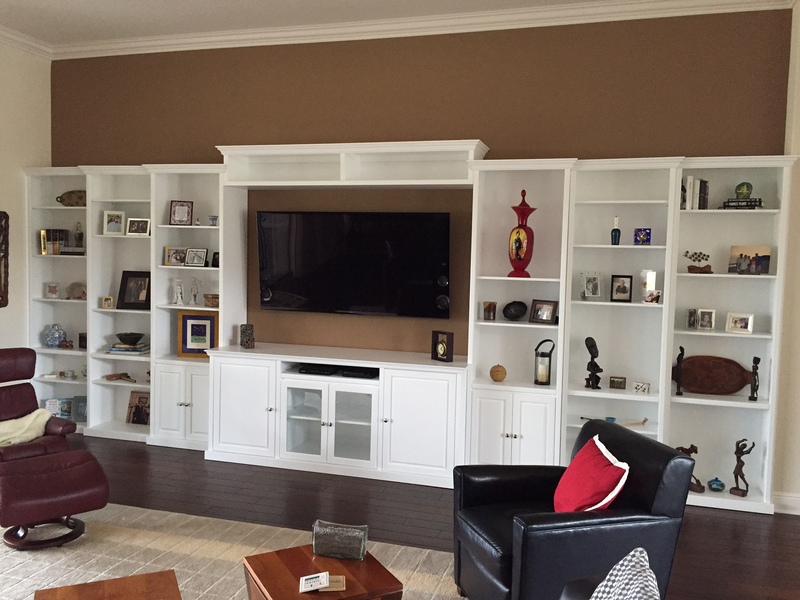 The central piece is a CN4 entertainment console 84″W x 36″H x 24″D, painted white with raised-panel doors. It has deluxe base moulding that wraps around the sides and is mitered to meet the moulding on the adjacent units. The piece above the TV is a BR2 bookcase bridge 84″W x 12″H x 16″D set above the other bookcases with deluxe crown moulding wrapped around each side. 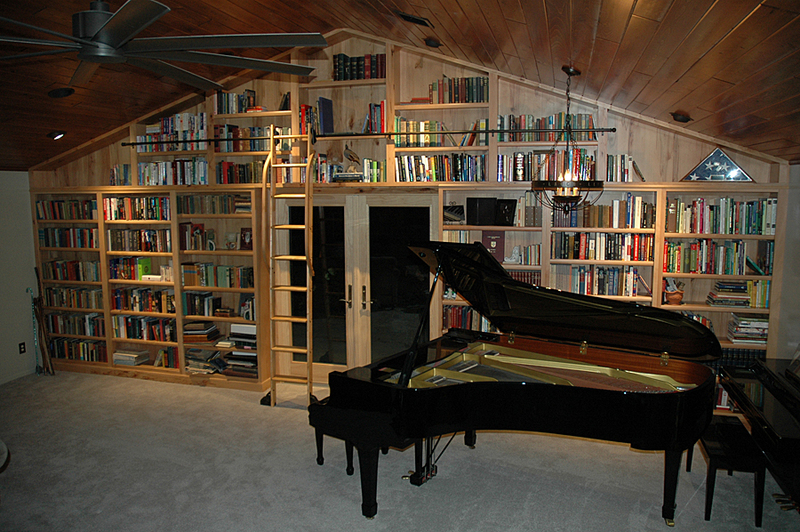 The bookcases on each side are stepped back, with the first 16″D, then 14″D, then 12″D. They have deluxe crown moulding that is wrapped around to meet the bookcase next to it. The pieces next to the center have a mini-miter so that the crown moulding overlaps the face frame of the bookcase bridge. On the outer side, they have a partial wrap with a mitered cut to meet the moulding on the next piece. The next piece has an inside miter cut to meet that crown, and so forth. The result is a seamless flowing sequence of moulding that appears built-in and connected. In reality, these were ordered pre-built to fit the design. Had the homeowner wanted to go all the way to the ceiling, we could have used base units with tall hutches, but since this is a very tall ceiling, it probably would have been overkill. 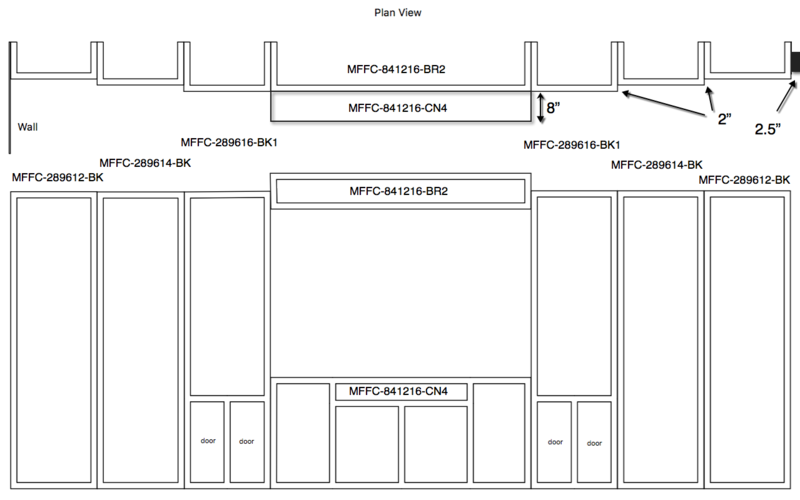 The diagram below was used to specify how everything would fit together. Work with the architecture of your room. 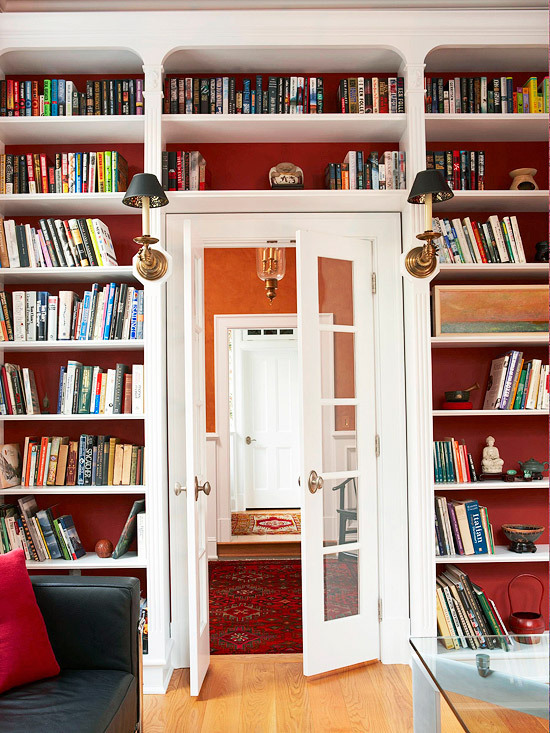 The alcoves to either side of a fireplace are the ultimate spot for built-in bookshelves. In Kit Kemp’s new hotel Ham Yard, the designer has carried them round the wall and over the door-frame, (a trick also favored by our editor Sue Crewe in her home) and teamed them with a chic patterned paper in muted colours. 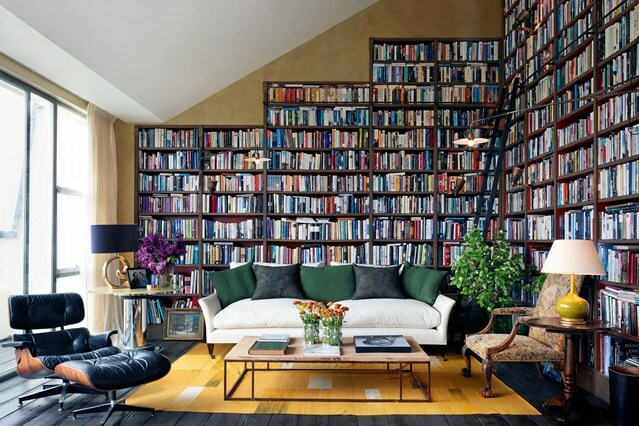 Floor to ceiling bookshelves add visual impact and character in the home of designer Beata Heuman. Try combining books with mirrors. Lulu Lytle, owner and director of the interiors shop Soane, uses mirrors on the walls that are not shelved to ‘maintain the feeling of open skies in our sitting room’. The clever use of storage, wrapped beautifully around the Peter Twining designed chimney wall makes the room feel lighter than air. The bookcase. It’s functional by maximizing space and aesthetically pleasing by adding height to balance out a room. The bookcase is also not just for books. It is a wonderful place to add treasures that personalize your space. 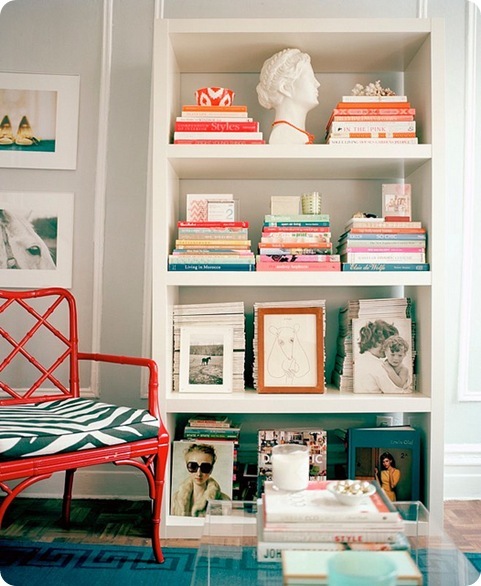 Here are some tips on how to style a bookcase. Remove all items from your shelves. Store or donate unsightly paperback books. 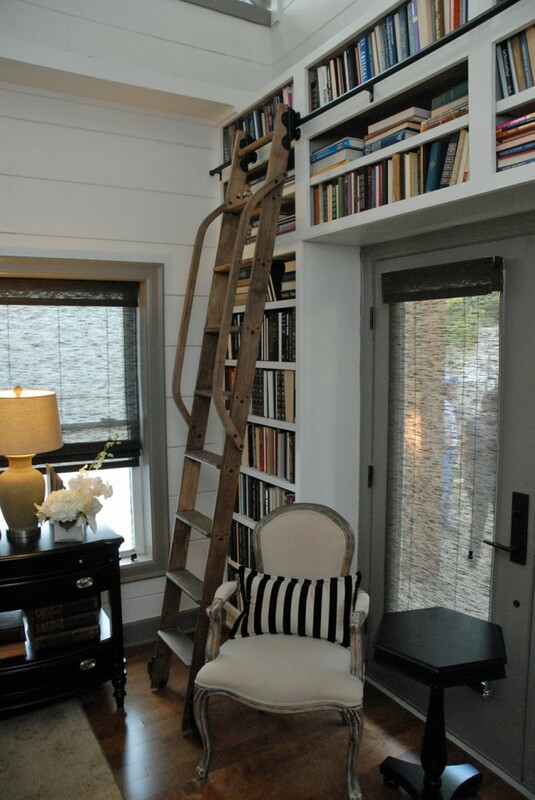 The study below is a beautiful example of how bookcases help maximize a space, while adding height for overall balance. 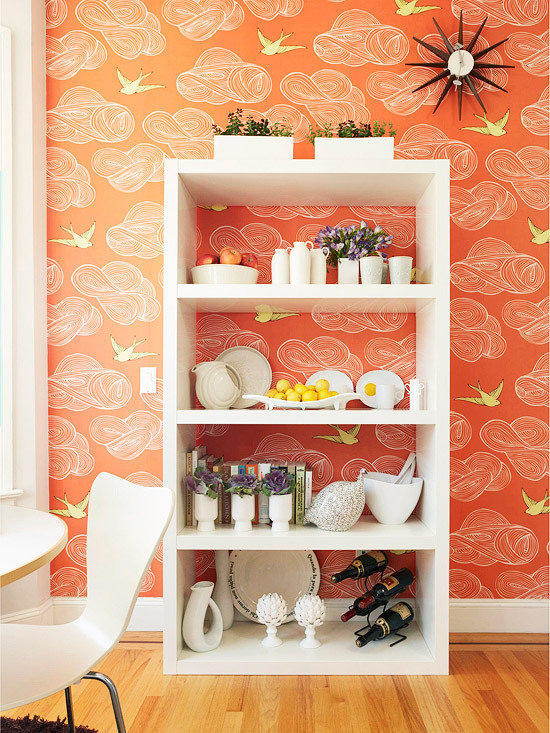 For visual interest, back your shelves with a contrasting wallpaper print or colorful paint. This gorgeous bookcase below is backed with Schumacher’s Imperial Trellis by Kelly Wearstler in Charcoal. 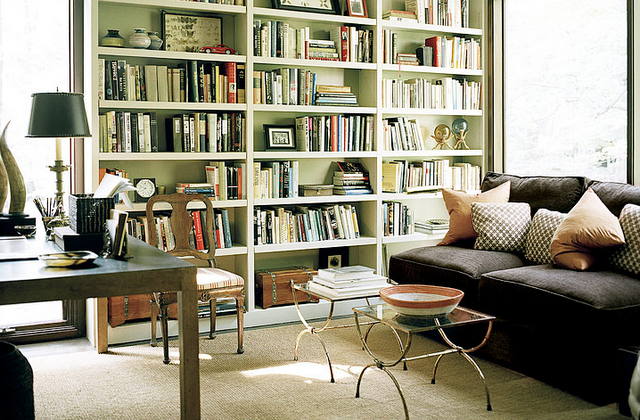 Books can be wonderful home accessories, so showcase the most beautiful ones in your collection. Arrange the books by size, subject and color. 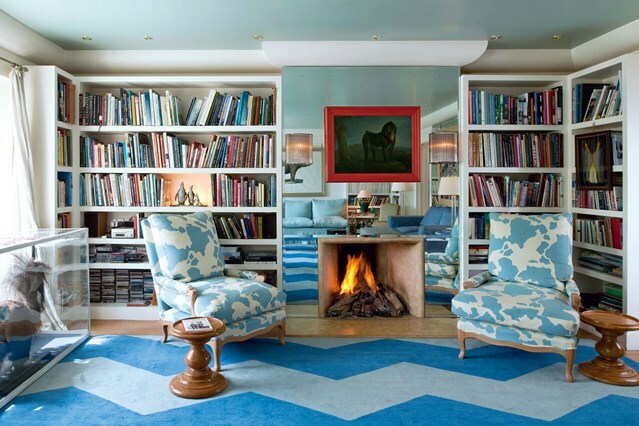 Create a rhythmic pattern by placing books vertically as well as horizontally. Horizontal books can also act as bookends. I love how the books and accessories are arranged in the built-in bookshelf below. Adding objects such as shapely ceramics, decorative boxes, small sculptures, family photos and original artwork makes your bookcase more visually interesting and personal. When selecting objects, be aware of the scale and color. Objects shouldn’t blend in or get lost on the shelves. Below is an example of beautiful bookcases flanking a fireplace that showcase more decorative objects than books. It makes me think that “bookless” bookshelves may show up more often as people go high tech and move to the Kindle or iPad to read books. ON a recent Saturday morning Cami Beghou, 13, pushed the right side of the tall, white bookcase that is built into one of the powder-pink walls in her bedroom. The bookcase, holding rows of books, a stuffed dachshund and a volleyball, silently swung outward, revealing a tiny, well-lighted room. Containing a desk, a chair and a laptop computer, it serves as her study area. 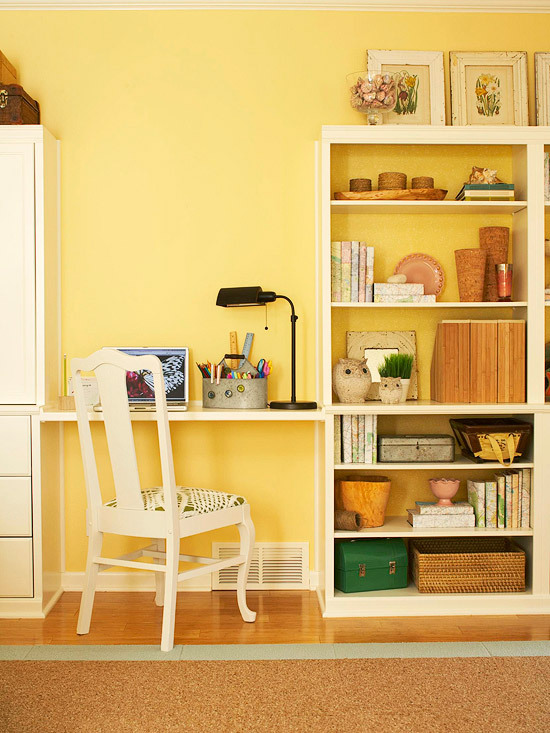 Cami Beghou swings open a bookcase to reveal her study area. Soon, however, inspectors and other guests may get wise to hidden rooms like the Beghous’. Although hard data is not available, architects report an increase over the last five years in the number of clients installing concealed rooms. During roughly the same period, at least four companies have come into existence producing doors that range from the very basic to the highly mechanized. The Beghous’ architect, Charles L. Page, who is based in Winnetka, said he had designed seven other houses with hidden rooms since 2001, after designing none in his previous 40 years as a residential architect. “Absolutely, there has been an increase,” said Timothy Corrigan, an architect and designer in Los Angeles, who noted that he has been practicing for 12 years but was not asked to design a secret room until four years ago. Since then, he has created five. Although highly fortified rooms have become more widespread — and the idea reached a large audience with the release of “Panic Room,” a 2002 movie that starred Jodie Foster — many of those adding hidden rooms are more concerned with creating a sense of wonder than defending against a home invasion. “I think people like the mystery of them,” Mr. Corrigan said. 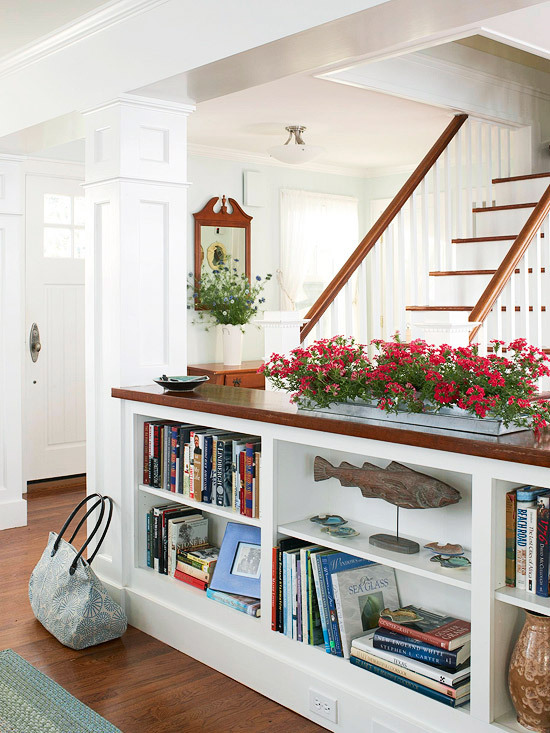 One popular trick is to hide a room behind a bookcase that looks like a standard built-in but is equipped with hidden hinges, rollers and handles, as at the Beghous’ house. Contractors can either build the bookcases themselves or buy a piece from a growing collection of companies, including Niche Doors, the Hidden Door Company, Hide a Door, Secret Doorways and Decora Doors. Prices range from about $800 for the most basic models to more than $10,000 for custom-made versions. Steven Humble is the owner and chief engineer of Creative Home Engineering, a two-year-old business in Tempe, Ariz., that specializes in mechanized doors that conceal rooms or safes. He echoed others in the business in saying that his customers are evenly split between those who plan to use their hidden rooms for security (either to hide valuables or to hide themselves in an emergency) and those who just think they are “really cool.” His company has built about 25 customized doors, bookcases, safes and assorted pieces, for new and remodeled homes, including a fireplace with a rear wall that swings open to reveal a room beyond, for a house in Arkansas. Prices run from about $5,000 to $25,000. Last month Mr. Humble installed a pair of hidden doors in a house in a town north of Sioux Falls, S.D., for ABC’s “Extreme Makeover: Home Edition.” “Whether it’s for home security or people’s images of living like James Bond, it seems to be something people respond to,” he said. Louise Kircher raises the staircase in her home in Mesa, Ariz., to reveal the secret room behind it. Hidden doors have their complications. Cami Beghou said that while the books stay put when she opens her bookcase door, the volleyball once rolled off, and she generally leaves the door open unless she is expecting company. 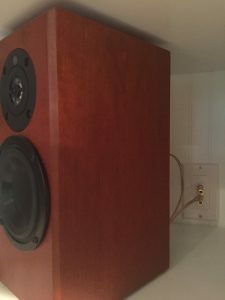 Jon Coile, chief executive of a Maryland realty company, said that he has had some problems with the magnetic latch on the bookcase door at the house he shares with his wife, Wendy, in Crownsville, Md., and that they secure the objects on the shelves to make sure they stay put. Ray Sullivan, a manager with a financial services organization based in Phoenix, has two hidden doors in his house and is working on a third. But he ran into a potential problem. One of the doors, a motorized bookcase, can be opened either by using a remote control or by knocking in a particular rhythm. “One time I accidentally left the remote on the other side of the door and forgot the knock code,” Mr. Sullivan said. For Mr. Coile, building a home with a secret room was a once-in-a-lifetime opportunity. Behind a bookcase in the library of his house is a compact spiral staircase that connects to an upstairs writing area overlooking the library and to a downstairs home theater as well as to a nondescript room with a view into a bar through a one-way mirror. They have shown the setup to so many friends that its secrecy has evaporated, which Mr. Coile said is fine with him. 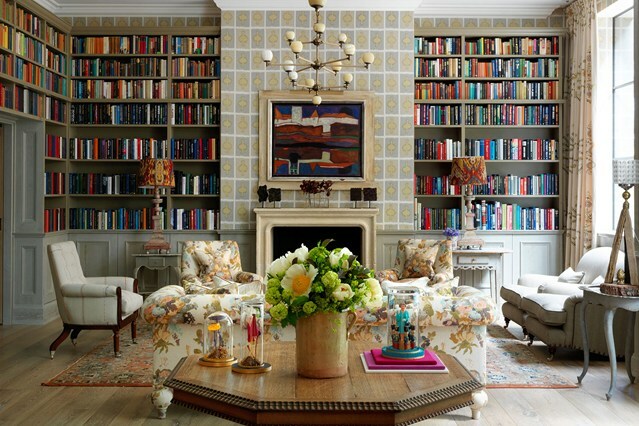 Bookshelves are often overlooked when it comes to designing the interior of a home. The truth is that the right bookcase in the right place can make a world of difference, increasing the beauty of an interior and decreasing the clutter. Here are a few suggestions for different types of book shelves to consider if you’re in the market. You can’t beat a good freestanding bookcase for convenience. Not only are they great places to store books and knick knacks, but they can be attractive furniture additions to your living spaces as well. 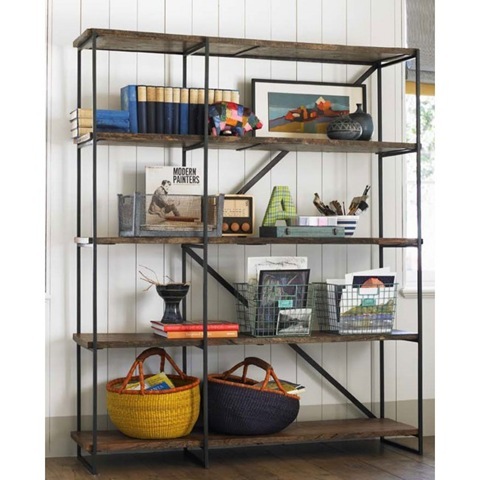 The beauty of freestanding book shelves is the incredible variety of styles available. Corner bookcases are wonderful for making use of those odd corners in the living room or den, and provide an attractive place to store and display books and other valuables. Rotating models are also available, and are very handy when used as end tables to store books, magazines, remotes, and other things you want to have within arm’s reach when stretching out on the couch. If you’re looking for something really distinctive, consider a doored bookcase, a close cousin of the china cabinet. These are great for displaying everything from grandma’s old dishes to that autographed copy of The Old Man and the Sea that you’re always telling everybody about. The fact is that when you’re talking freestanding book shelves, there’s a model out there that will satisfy just about any space, taste and budget. 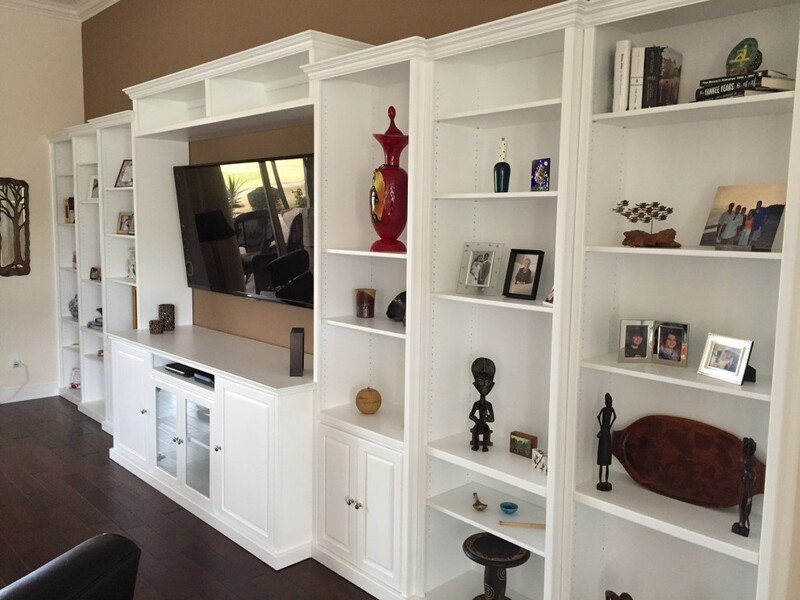 If you’re feeling overwhelmed with the amount of furniture you already have, you’ll want to consider having built in bookcases installed instead. These can be custom designed to fit your living spaces, and often can be fitted in out of the way places or recessed into a wall where a freestanding model just wouldn’t work. Some examples of places where built in bookshelves can really bring a room together include around fireplaces, doors and windows, beneath stairs or running up them, and in odd corners throughout the house. Bookcases have even been built in to serve as a barrier and divide a room into two distinct areas. 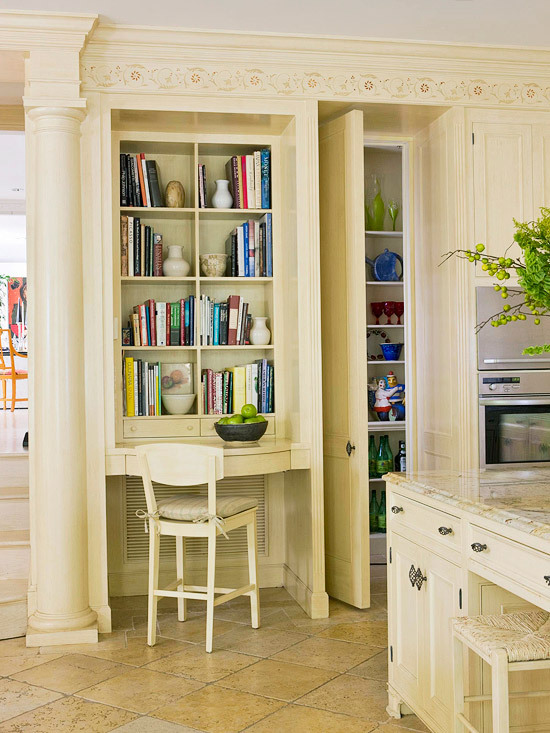 If you have a space you think a custom built-in bookcase might be the ticket, Highlands Designs can make it happen. Time to go above and beyond library walls. Why not maximize your space? Finding a ladder set up that will provide access yet give you flexibility and room to cook is the way to go. A great use of space for fashion-savvy folks. 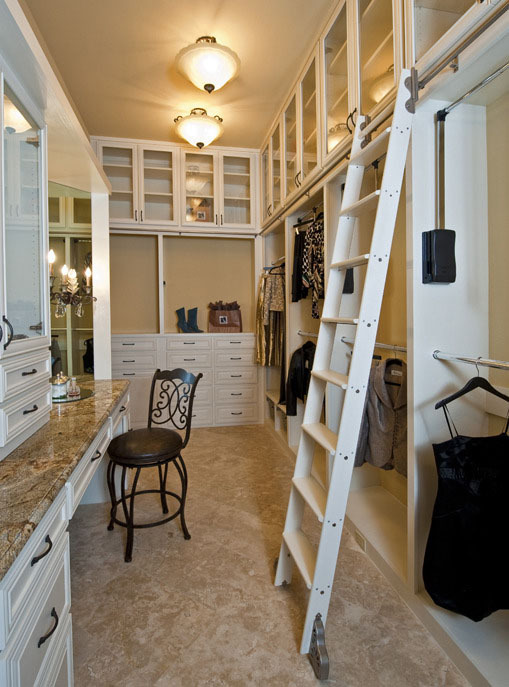 Especially if you are shuffling multiple outfits or bodies in and out of a compact area, the dressing room rolling ladder may make it all come together. The right rolling ladder can bridge elegance in design to enabling so many options – wouldn’t you want to explore those sprawling bookshelves with your guests, as the piano plays on through the night? If you have files up to your eyeballs, or higher – maybe it’s time to maximize the shelving space available. 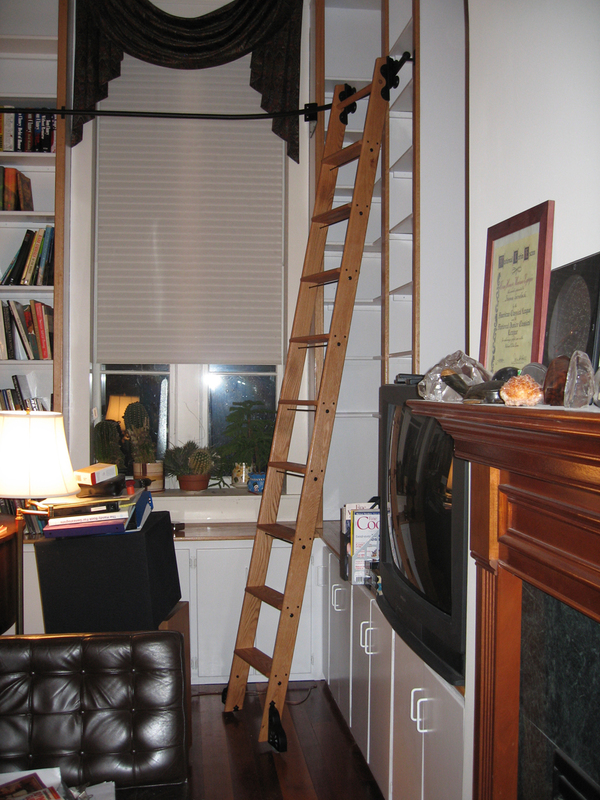 Or if you are in a tight city apartment, and your “office” and “living room” (and more) don’t exactly have clear boundaries, the rolling ladder can help. Did you notice how the curved support rail connects between shelves, passing over the window? Sometimes fitting a true stairwell into a space just doesn’t work. With the right set up, a bit of strategy and some innovation, a rolling ladder could do a good stand-in for a full stair case. 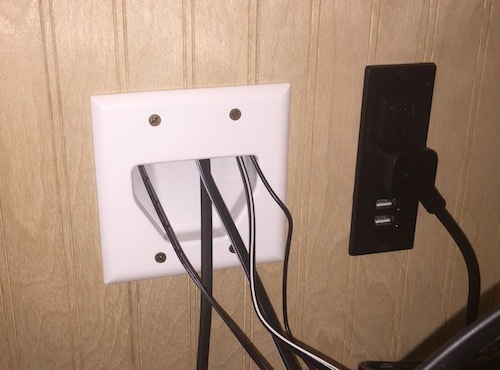 Don’t let that extra wall space go to waste. 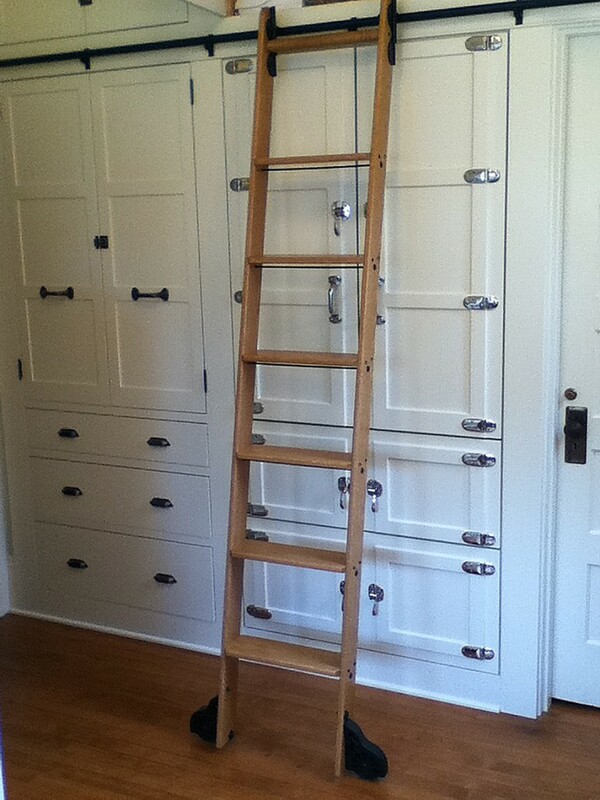 A well-placed rolling ladder can give you access to storage or shelving that a doorway might otherwise inhibit. 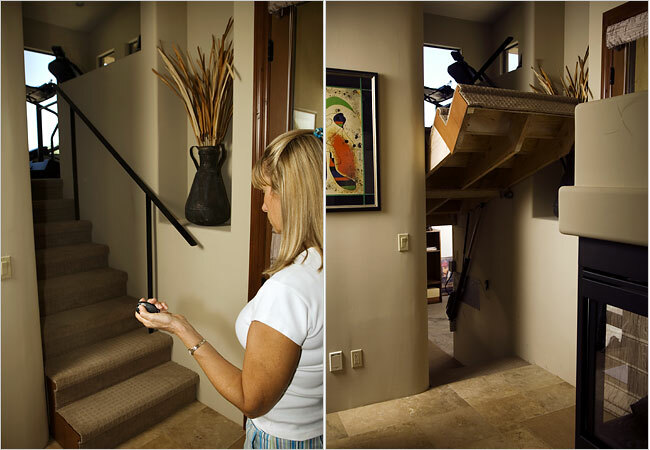 With a built-in ladder you can re-position at will, there is no more hassle. 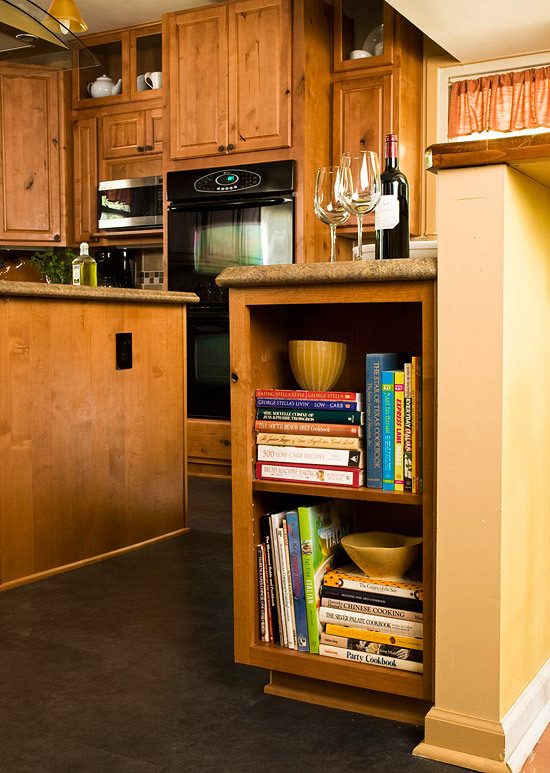 Got a tall pantry or alcove where you store particular items? Maximize the area by using a rolling ladder – compact and flexible. Are you a collector? Is your spouse one? Maybe you have an extensive wardrobe or need to maintain one for your other activities; this might be the perfect solution for you. 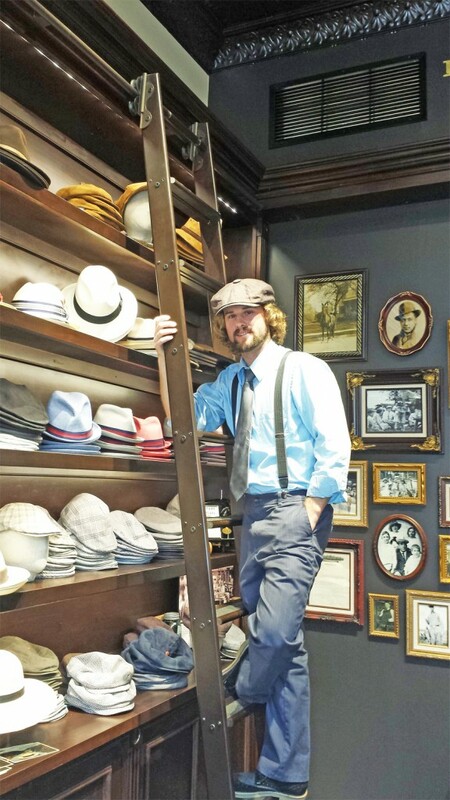 Keep your accessories and special items within arm’s reach, and bring some serious style to your wardrobe with a rolling ladder in your closet. With all of these great ideas, have you found out where a rolling ladder would best fit in your home? Let us walk you through selecting all the right parts with our step by step ordering process – we’ll help you every step of the way. Or check here if you want to browse our Ladder Kits and various components. Bookshelves do double duty as storage space for books and display space for accessories. Learn how to arrange shelves so they are both fully functional and pleasing to the eye. To style a bookcase to perfection, resist the urge to pack in accessories on every shelf. Keep a clean look by choosing a one-color or tone-on-tone scheme for vases and figurines, and make sure to mix up shapes. Every so often, step back to assess the overall balance of your arrangement. Place items off-center or try larger or smaller ones until you like what you see. Built-in bookshelves surrounding a doorway can be tricky; start by filling the top row with books. 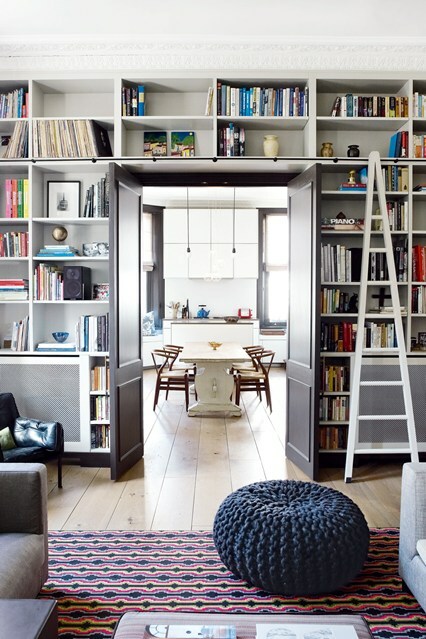 Alternate the remaining nooks with creatively stacked books and accessories. To add interest to your book collection, alternate stacking books horizontally and vertically. 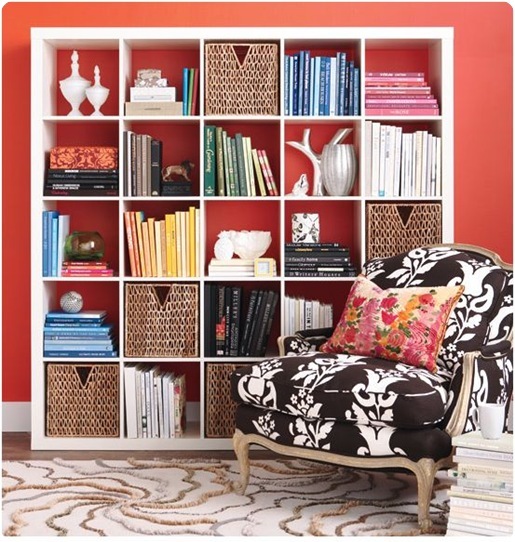 Bold-color picture frames make great bookends and help photographs stand out on shelves. Mod shelves call for a sparse look, so group together a small set of books that are all of fairly uniform size. Accessorize with streamlined vases, leaving lots of open space on shelves to let the accessories shine through. To give office shelves an organized feel, gather a wide variety of collectibles and place them between books, creating loose symmetry. If you have a picture frame or square shape in one shelf, mirror it with a collectible of a similar shape and size. In a wall of shelves such as this, it’s important to scatter books here and there to punctuate the look. Carry your color scheme onto your bookshelf to give the room a sense of unity. 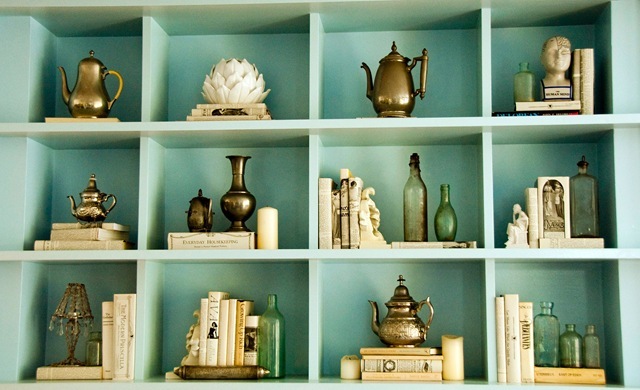 Here, accent accessories on the shelves match the light blue wall color. 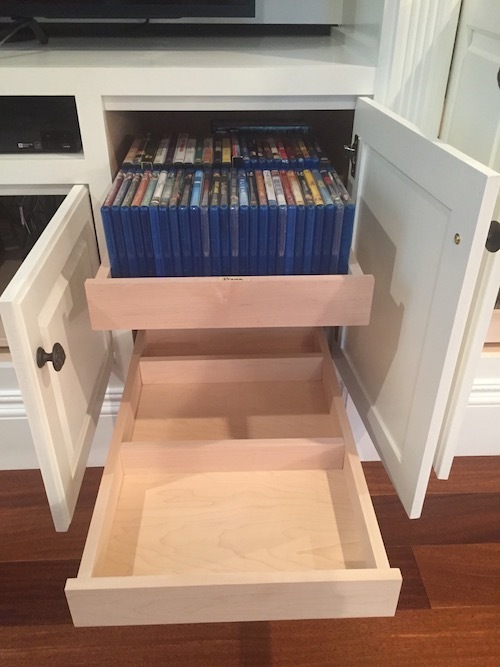 Storage boxes conceal items such as toys and movies that you may not want out in the open. Utilize a built-in bookcase as a fashionable and functional headboard. Baskets hold eyeglasses and lotions, leaving plenty of room for a library of nighttime reading materials. 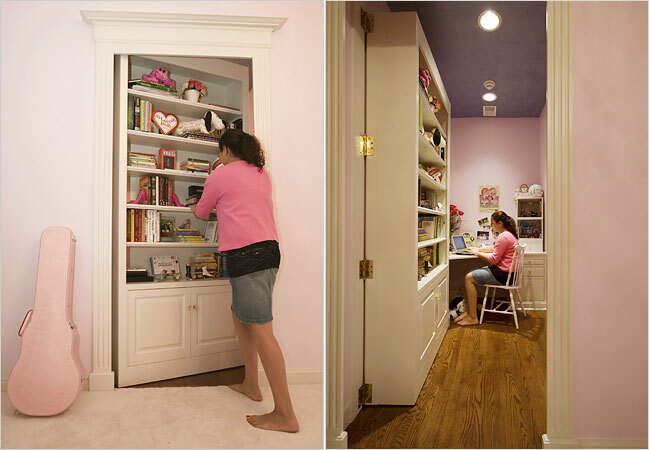 Add more appeal with adjustable reading lights mounted inside the bookcase. 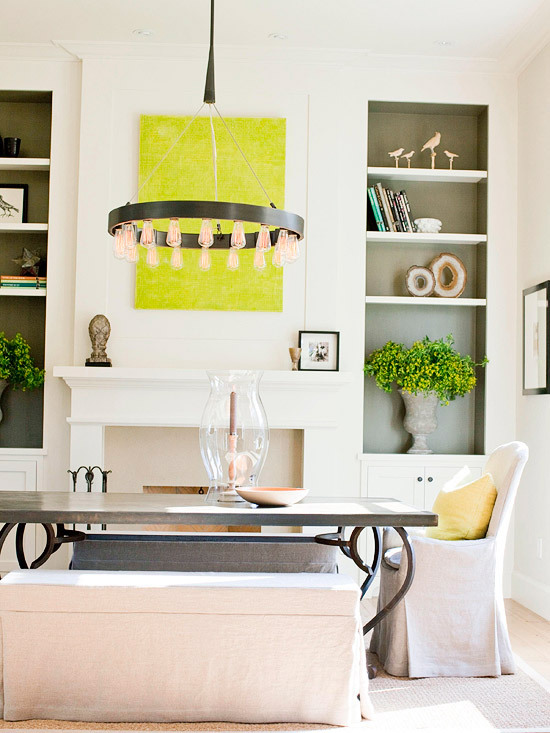 Hang a favorite piece of artwork on the front of the shelf for visual interest. 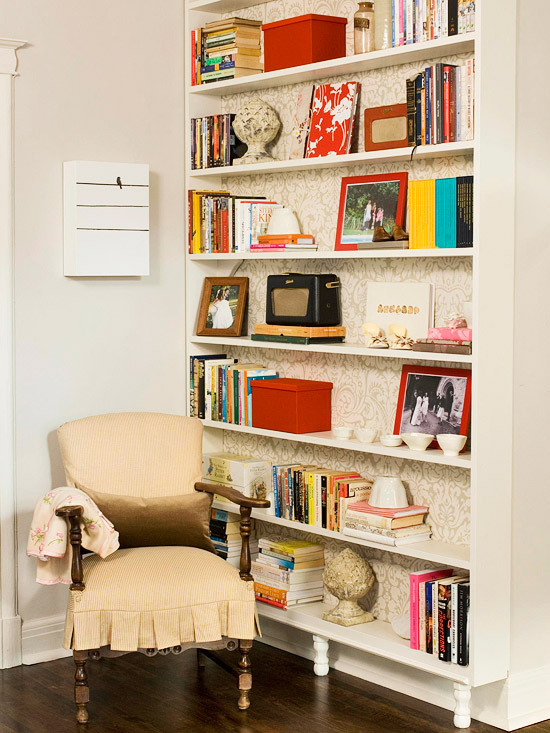 Adding wallpaper or printed fabric to the back wall of shelves creates a unique look and is an easy way to personalize a bookcase. 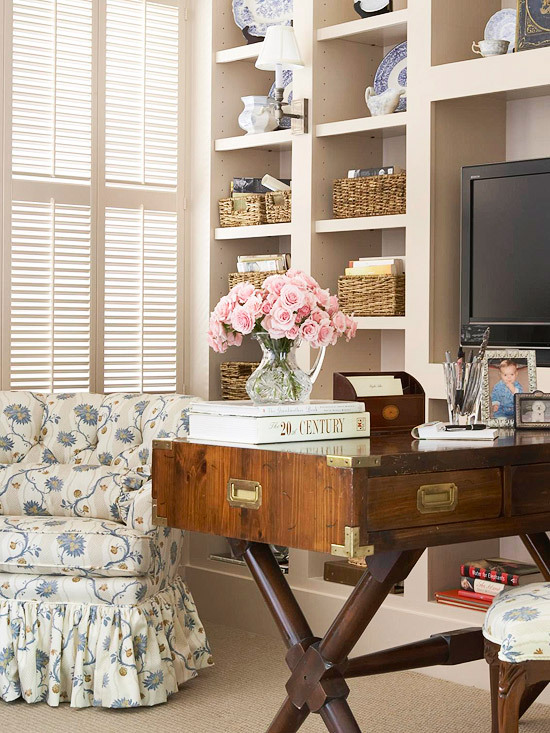 Add woven baskets and decorative storage boxes to easily organize magazines and maintain a clean look. Attach fun labels to shelves to establish an organizing system for your books. 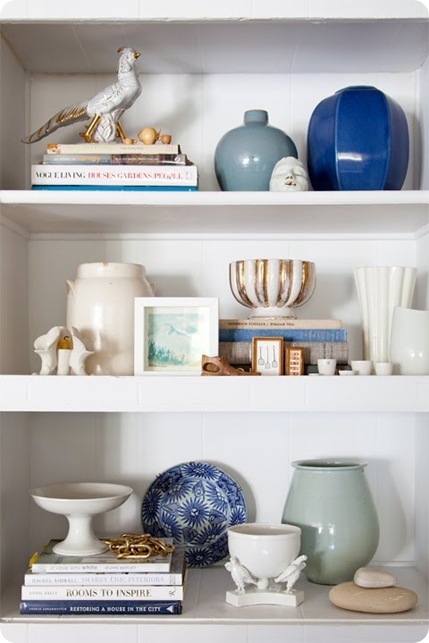 Use pieces of sturdy pottery as bookends to keep shelves neat. Bookends especially come in handy for paperbacks and slimmer books, which are less likely to stay upright. If your book spines lack visual style, paint your bookshelf a vibrant color to make it the focus. To highlight the color even more, choose a single contrasting shade for accessories. Books can be used to create visual interest. Pyramidal stacks on the center shelves contrast the top shelf of entirely vertical books. Layer pieces of art behind shorter books or small accessories such as figurines. For a display-worthy bookcase, organize paperbacks in pretty baskets. Group like books together (by author, genre, etc.) and put labels on the baskets so books are easy to find. 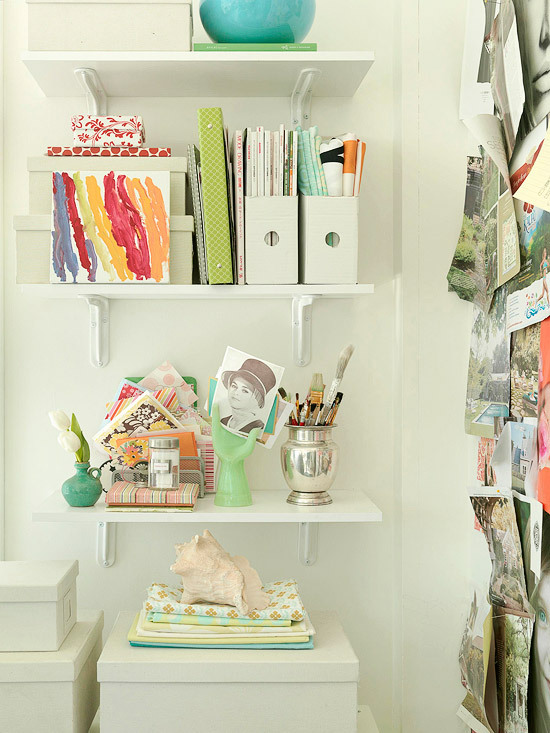 Shelves are great tools to keep a craft workroom organized. Slip magazine holders on open shelves to hold loose papers. Storage boxes conceal clutter and can be kept a neutral color to blend in. For a bolder look, cover boxes with printed paper. Use decorative containers and flea market finds to hold paintbrushes or pens and pencils. Vary heights and create interest by stacking books horizontally to use as platforms for displaying other objects. 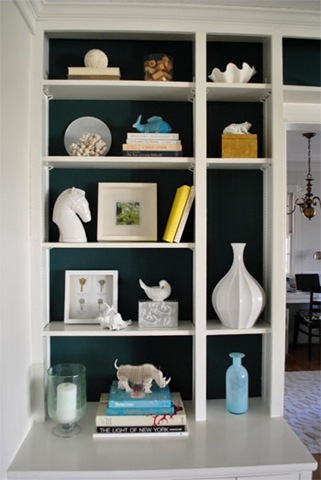 Pull together a small bookcase by arranging the top and bottom shelves in opposite ways. Deep shelves give you the luxury to play with layers. 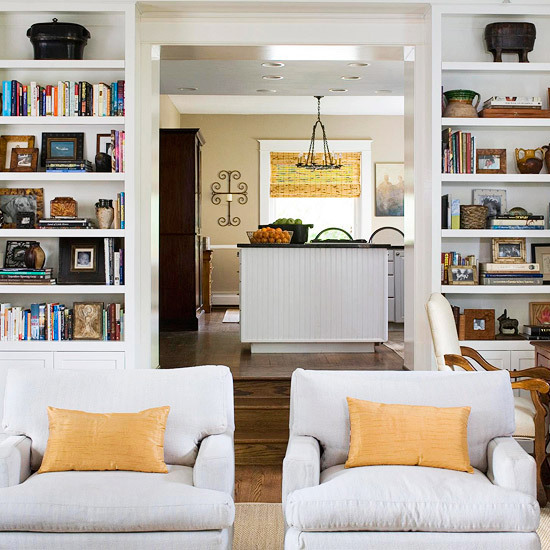 Lean plates and artwork along the back of the shelves, and anchor them with books or heavier objects. Place a few small pieces of art near the front of the shelves to give them depth. Turn bookshelves into a family photo zone by lining them with framed photographs. Place small photographs on stacks of books if there’s room for both. 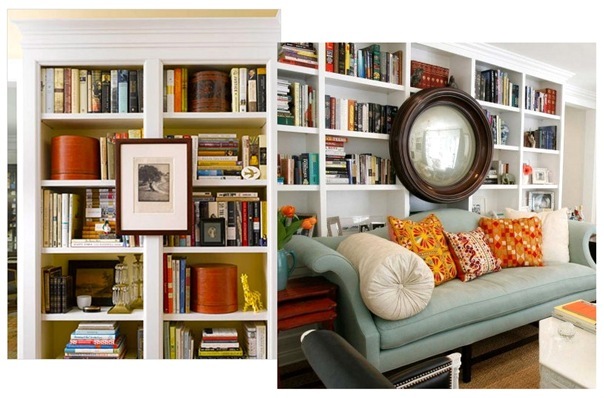 If your shelves are deep, try pushing the books to the back and placing photos in front. Focus attention on a favorite small sculpture by placing it solo on a shelf. 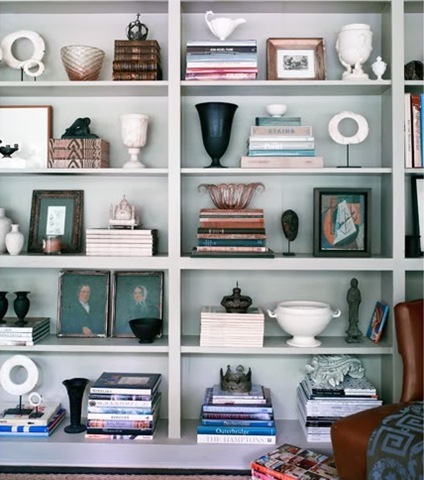 Punctuate the display with groupings of books propped up with small vases or matching bookends. Get the most storage and style out of built-ins by filling the shelves with books; stack them vertically on the lower shelves and keep the top shelves more open. Arrange accessories two or three deep, keeping them fairly symmetrical for a clean look. I truly love to see bookcases in homes because they are the perfect solution for adding storage and style to your surroundings. 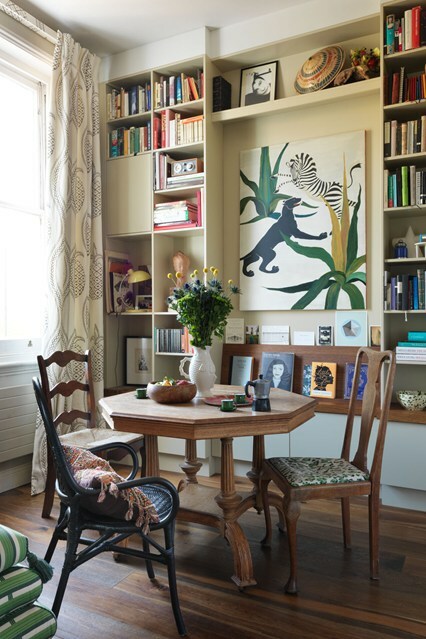 Books and collectibles on display add warmth and personality to any space, whether it’s a living or dining area, bedroom or home office. To any visitor, a bookcase will communicate what you read, what you collect, and what you love. Bookcases are a window into your passions and pursuits, and an opportunity for you to put your most favorite things on display. 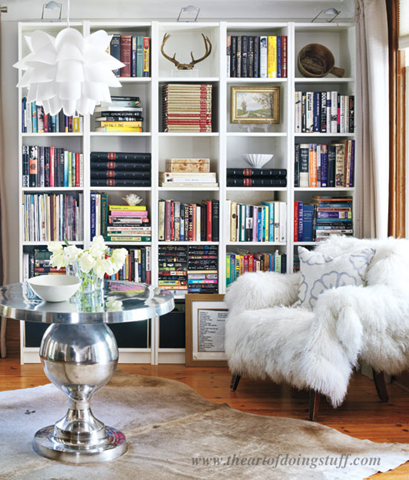 The challenge for most people is how to style a bookcase well. 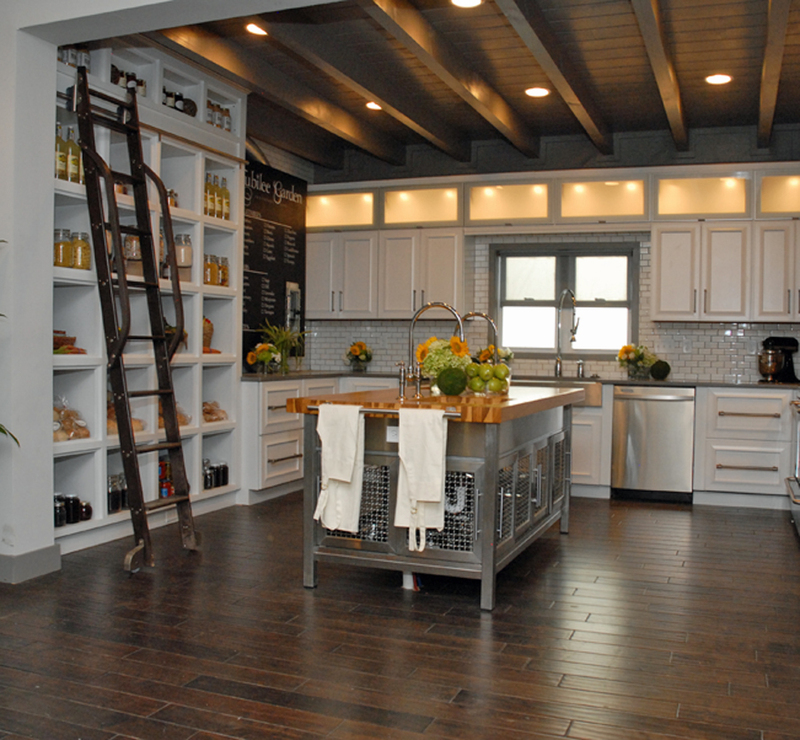 How do you maximize both utility and aesthetic appeal, but also avoid monotony and clutter? 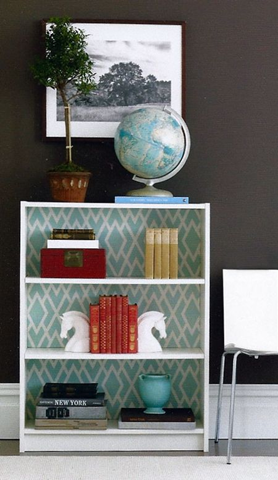 Styling a bookcase is an art, but a job easily tackled if you study those done right. It Starts at the Back. 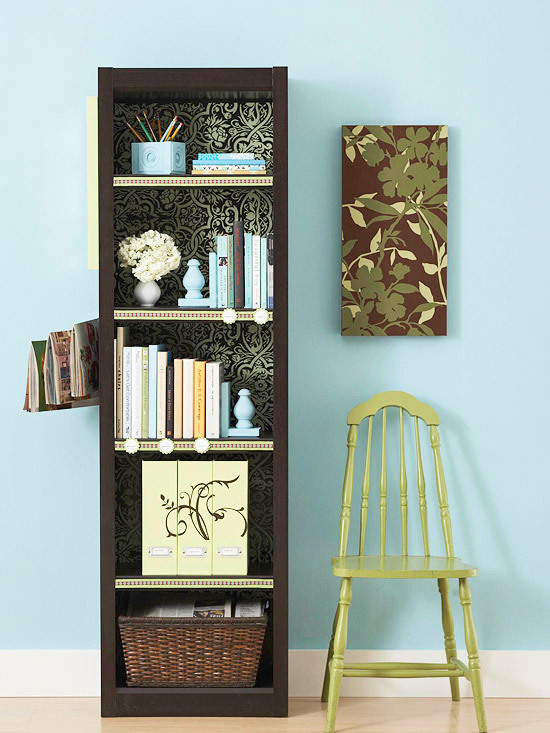 Simple inexpensive bookcases become stunners when their backs are dressed up with paint, fabric or wallpaper. Eddie’s Billy Bookcase was brought to life with a pattern that accentuates the balanced display of books and collectibles. When styled against a backdrop of robin’s egg blue, this collection from the home of model Coco Rochas has visual appeal, and showcases a love of books, antique coffeepots, vases, and glass bottles. Think in Layers. Here is a shelf masterfully styled by Emily Henderson. Notice the balance achieved between the books alternating in placement from left to right with the ceramics poised on the opposite side. The middle shelf repeats the books plus ceramics combination, and also provides the opportunity to display smaller collectibles. Different heights and textures also add to the appeal. Vary Book Placement. Did you know there are 7 ways to stack books? 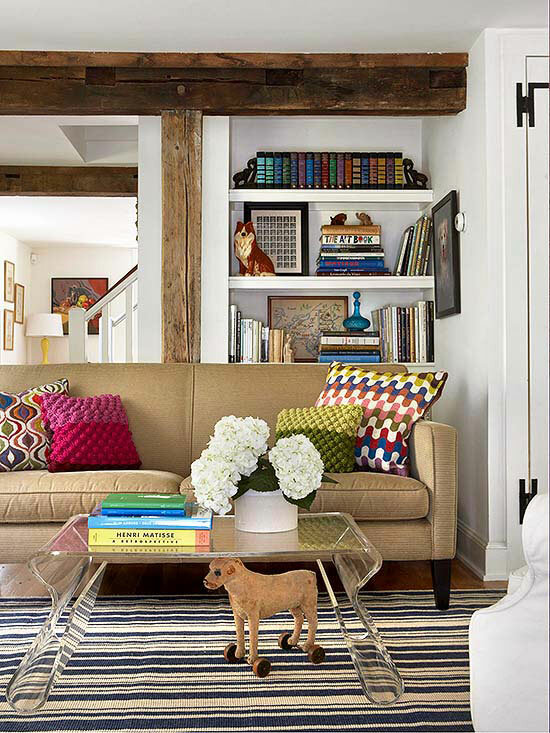 Karen fromThe Art of Doing Stuff teaches us how she styled hers in her IKEA Billy bookcases to break up the columns. Notice how she doesn’t just stick to books, she adds art and natural objects too. And don’t you love that reading chair? Arrange Books by Color. Inside this IKEA Expedit, the books are grouped by color, and also displayed both horizontally and vertically. Practical baskets mix with glass bowls, vases and collectibles to form an aesthetically pleasing display on a brightly painted wall. Hang Something. There’s no rule you have to keep it all inside. Why not add one more layer of interest? Consider using the framing of the bookcases to suspend a dramatic mirror, framed artwork, or sentimental photographs. It’s OK to be Single. Smaller cubbies look simply perfect with a textured or sculptural object placed all by itself. 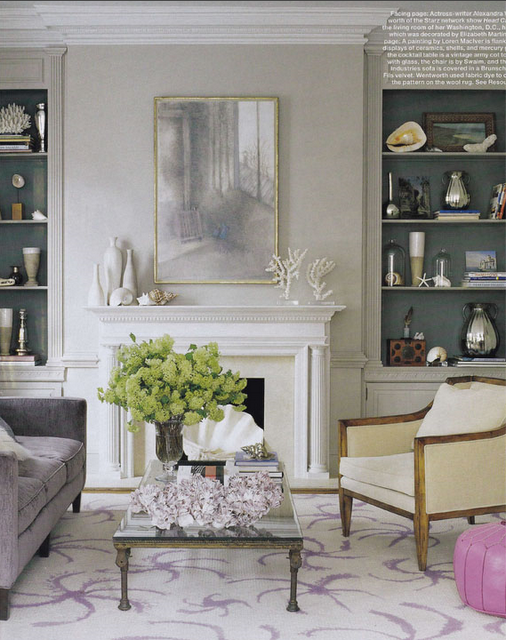 Notice the use of a single vase or shell in the smaller spaces of John & Sherry’s bookcase, and the fantastic contrast with bold blue and crisp white. Think Oddly. Objects tend to look better when gathered in odd numbers, and the basic design principle of the rule of threes is cleverly applied in this bookcase featured in Lonny Magazine. Notice how most of the books are stacked horizontally, but the bookcase becomes so stylish with the varied and perfectly placed decorative objects, prints, and forward facing book covers. Varied groupings of three or five are always visually appealing. 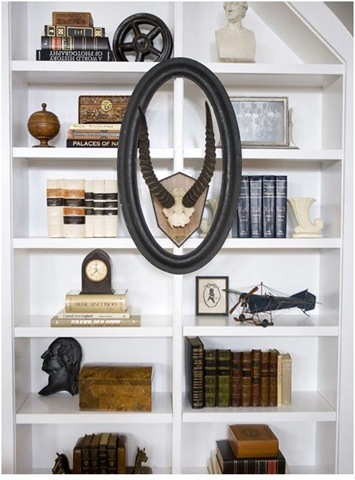 This bookcase from the home of Lisa Martensen is an example of a well edited display from her treasure hunts and travels all around the world. Allow Room to Breathe. With airy shelving, it’s best to not overwhelm and allow for plenty of breathing room around objects. Deliberate use of open space keeps the eclectic collection on this bookshelf from appearing too cluttered. With a little concentration, it’s possible to style a bookshelf well with both books and the things you love. The secret to doing it successfully is truly all in the placement and editing of your favorite objects.